3. Create an account or log in your Shipping Cart account. You will receive an email notification once your account has been created. This contains your account number and the U.S. address you will use when shipping your items. 5. Checkout using your Shipping Cart address as your delivery address in the U.S. including your account. You will be notified when your package arrives at your Shipping Cart address. 6. Once the item/s has been delivered to your Shipping Cart address, you can consolidate the items on your Shipping Cart account. Go to your Shipping Cart "Cart" tab where you will see all the items received from various U.S. online stores. Click "View" to view a photo of the item. This serves as visual confirmation of the status of each item as it was received. Select the items you want to consolidate into one page then ship via Air Cargo. Shipment cost estimates is indicated on this page. Click "Ship It" to proceed to checkout. To proceed with shipment, choose the preferred shipment option (Air Cargo). Upon checking out your item/s for delivery to the Philippines, select Credit Card or PayPal as your payment option and enter your details. Your total shipping fee is inclusive of your all-in door-to-door delivery fee (USD10 fixed rate nationwide). 8. 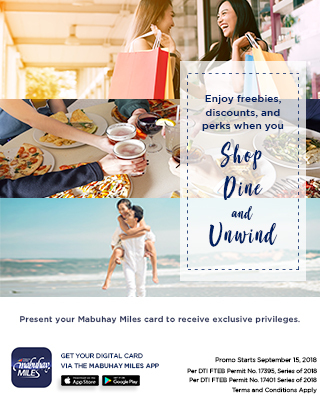 Enter the Mabuhay Miles promo code in the promo code field to avail of discount. The discount is going to be deducted from the total amount of payable shipping fees payable. a. Your all-in door-to-door shipping fees to the Philippines will be calculated. b. Upon checkout, enter the promo code in the field provided. c. Once you make your payment and get your tracking number, you can view the status of your shipment. 9. Offers can be availed from October 3, 2018 to March 14, 2019 only.